Our Fundraiser is finally live!!! Come take a look at a great Bundle of 10 products and over 250 pages from various TpT Sellers. 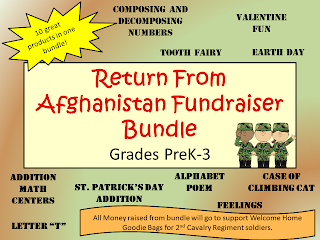 The bundle is for grades Pre K-3rd grade. I will post updates as often as I can. Thank you so much for your support! I am getting ready to place an order for supplies thanks to proceeds received from the Fundraiser Bundle. Pictures are coming soon! Thank you so much for your support.